The petition urges the Citizen Stamp Advisory Committee to recommend to the Postmaster General a stamp in honor of New Horizons. We’re starting now because it can take three years or longer for a postage stamp proposal to result in an actual stamp. So sign this petition by March 13 — the 82nd anniversary of the announcement of Pluto’s discovery — and tell your Facebook friends and Twitter followers to sign as well! So why not add your name? It only takes a minute and I’ve never received any spam that I can tie to signing petitions at Change.org. Earlier this month, I gave a minor overview of NASA’s Gravity Recovery And Interior Laboratory (GRAIL) mission. I had mentioned that the two mirror-twin spacecraft that make up the mission were currently — and temporarily — dubbed GRAIL-A and GRAIL-B, with official names coming later in the month. Beginning last October, NASA appealed to elementary students to come up with replacement names for the spacecraft. Over 11,000 students, from 45 states and several territories, participated in contest, making for stiff competition. Ultimately, it was the 4th Grade students from Emily Dickinson Elementary school, in Bozeman, Montana, who were chosen as the nationwide winners of the naming competition, with their names of Ebb and Flow. The students arrived at their name by researching what the GRAIL mission was studying and how it worked. They learned how important the Moon is to our lives on Earth, and how the Moon’s gravity causes our high and low tides. They decided on Ebb and Flow, because the names represent both the Moon’s gravity and its effects on our home. Congratulations Emily Dickinson 4th-Graders! Not only did you come up with great contest-winning names, you came up with names that will forever exist in the historical pages of the world’s exploration of space! The 365 Days of Astronomy podcast episode for January 20 has expanded information about the competition winners. NASA.gov – Flying past Saturn’s moon Dione, Cassini captured this view which includes two smaller moons, Epimetheus and Prometheus, near the planet’s rings. 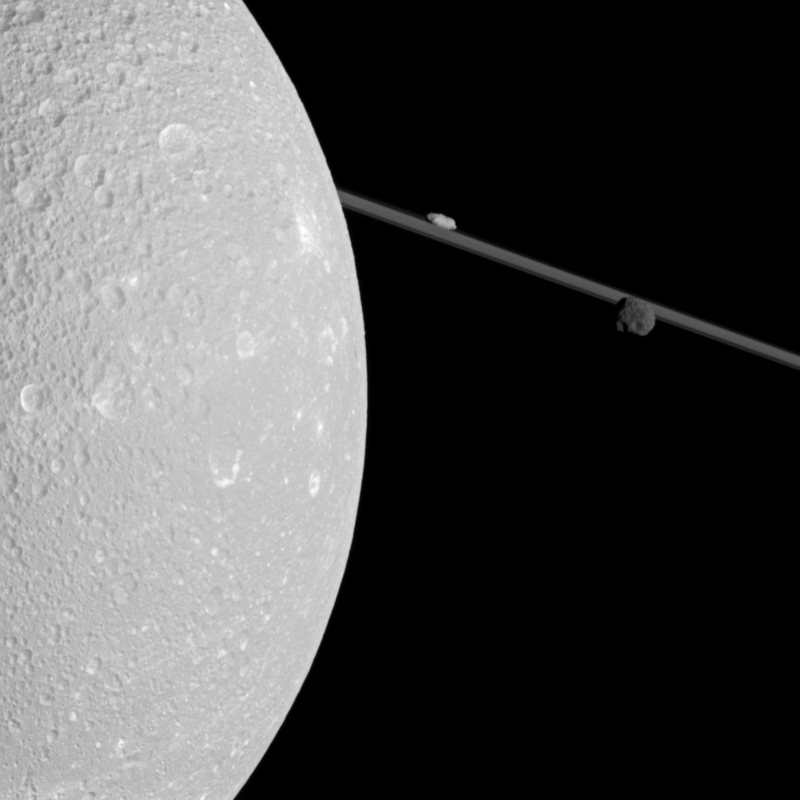 Dione (698 miles, or 1,123 kilometers across) is closest to Cassini here and is on the left of the image. Potato-shaped Prometheus (53 miles, or 86 kilometers across) appears above the rings near the center top of the image. Epimetheus (70 miles, or 113 kilometers across) is on the right. This view looks toward the northern, sunlit side of the rings from less than one degree above the ring plane. The view was acquired at a distance of approximately 67,000 miles (108,000 kilometers) from Dione. Image scale is 2,122 feet (647 meters) per pixel on Dione. Astrophysicist, and renowned promoter of science, Neil deGrasse Tyson, sat down for an interview on The Daily Show with John Stewart. As always, Neil’s commentary drips of a passion for discovery and exploration. Science and comedy mix well! As expected, the failed Russian spacecraft Phobos-Grunt came screaming back to Earth, breaking apart during its collision with our atmosphere, and landing somewhere near 700 miles West of Chile in the Pacific Ocean yesterday. While the Russian Federal Space Agency, commonly referred to as Roscosmos, has not yet reported any visual observations of debris impact, they were able to note the point it disappeared from orbit. The 13+ ton craft, most of its weight owing to the onboard fuel that would have taken it to Mars’ moon, Phobos, was one of the larger to return to Earth after failure. It isn’t currently known — and it may well never be — how much of it burned up in the atmosphere and how much made it to the Pacific — and then, how large those pieces were and what they were composed of. Tthe best case scenario is that all of the fuel burned up in the atmosphere. Now, the focus will be on what went wrong, which is turning into a drama of its own with Russian officials suggesting that its failure was the result of Russian “anti-heroes” or a secret US military facility in Alaska (HAARP, I presume) purposely disabling the craft from the ground. Following up on a previous story about the failed Russian space probe, Phobos-Grunt, all hope of reviving the craft has been eliminated. Phobos-Grunt is expected to fall back to Earth by the end of this month. The only real questions remaining are when, where, and what might survive re-entry. It is not uncommon for spacecraft to re-enter Earth’s atmosphere, even uncontrolled (which to a degree, they all are). Disintegration upon re-entry is one of the space industry’s most popular disposal methods for decommissioned and defunct satellites and spacecraft. However, they generally aren’t carrying the amount of fuel that Phobos-Grunt has on board. Most of its 13 tons of weight is fuel — hydrazine and nitrogen tetroxide stored in aluminium tanks. Since fuel tanks are generally specifically designed to withstand extreme pressure and heat, they often survive re-entry; however, the Phobos-Grunt tanks were constructed out of aluminium, which is not only cheaper, but has a lower melting temperature than other common materials. Aside from the fuel, there is also a small amount — less than 10 micrograms — of radioactive Cobalt-57, but such a small amount does not pose any significant problems. According to Holger Krag, deputy head of the European Space Agency’s Space Debris Office, at the European Space Operations Center in Darmstadt, Germany, the chances of anyone seeing the re-entry, let alone be impacted by any of the debris from Phobos-Grunt, is very low. With more than 70% of our planet covered in water, odds are that any debris surviving re-entry will end up in an ocean. To sort of sum it all up, Phobos-Grunt will soon be toast. If you’re very lucky, you might see a spectacular light show. It will probably not land on your head. Though, there were some positive aspects to come from the failure. For example, the re-entry is a new target for the Inter-Agency Space Debris Coordination Committee, which is “an international governmental forum for the worldwide coordination of activities related to the issues of man-made and natural debris in space”. The more debris we add to Earth orbit, the more important it is to be able to track and deal with the potentially-devastating material; so any “practice” that Phobos-Grunt will provide would be useful. Additionally, the failure of Phobos-Grunt provided an opportunity for various nations and agencies, as well as professionals and amateurs, to work together on trying to revive the craft, track its orbit, and now chart its re-entry. Information was shared between all of the interested parties and there was much collaboration and cooperation; all of which is important if we are to have a global recognition of the importance of space exploration and the global initiative to work together to continue exploring. While many of you were partaking in New Year’s celebrations, engineers and other specialists at NASA were also celebrating; albeit, something a bit different. NASA launched the twin GRAIL-A/GRAIL-B spacecrafts from Cape Canaveral Air Force Station on September 10, 2011, on a nearly 4-month journey to the Moon. 1(footnote below) On December 31 and January 1, GRAIL-A and GRAIL-B — respectively — completed their journey into lunar orbit. At this point in the mission, the mirror-twin GRAIL spacecraft are maneuvering themselves into a flying formation that will place them on a near-polar orbit, 34 miles (55 km) above the Moon’s surface. While the craft are currently completing an orbit approximately every 11.5 hours, over the coming weeks controlled burns will reduce that time to just under 2 hours. From there, the science begins. In March, GRAIL begins its task of creating a comprehensive and detailed map of the Moon’s gravitational field. This will provide tremendous insights into the internal structure of our natural satellite, from core to crust. It will also reveal the history of the Moon’s episodes of heating and cooling. Understanding this thermal evolution takes us a step closer to fully understanding the Moon’s origin and the processes it undertook over the past 5 billion years, to make it what it is today. This new knowledge will extend our understanding not only of the Moon, but the other rocky inner solar system planets as well. For the kids; our future. Both spacecraft contain a camera called GRAIL MoonKAM (Moon Knowledge Acquired by Middle school students). MoonKAM is installed solely for education and public outreach, being led by Sally Ride (the first American woman in space, but of course you knew that) and her Sally Ride Science team. GRAIL MoonKAM is designed to engage middle school-aged students from across the nation. 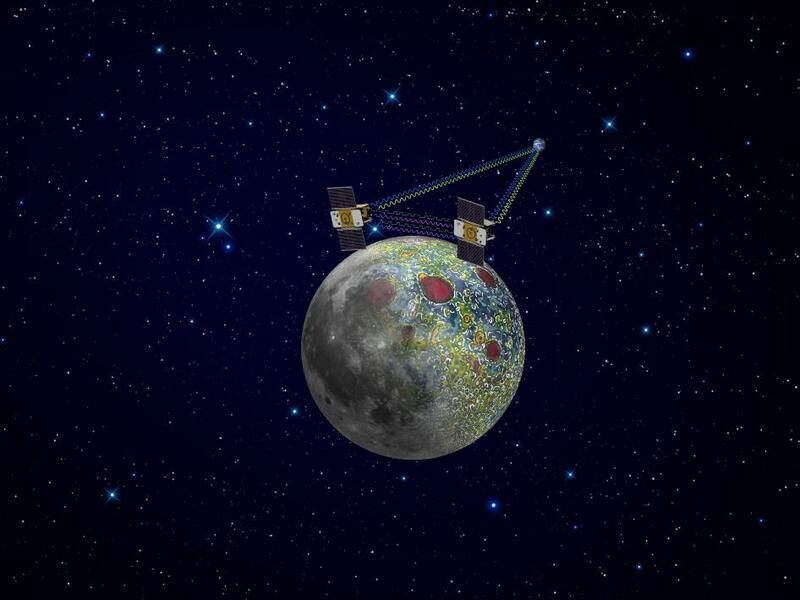 Students will be able to target areas on the surface of the Moon, submit their requests to GRAIL MoonKAM, and then receive photos of the target area to be studied in the classroom. In addition to GRAIL MoonKAM, beginning in October of last year students were also able to enter a contest to choose new names for the spacecraft. So if the names, GRAIL-A and GRAIL-B aren’t particularly exciting to you, the new names are expected to be revealed later this month. I’m excited to see what GRAIL reveals about our nearest interplanetary neighbor. The Moon still harbors a number of puzzling mysteries, and there’s a good chance that GRAIL might shed some light onto their answers. GRAIL is a comparatively short mission, expected to conclude around early June of this year; so, our new data and understanding will be coming to us soon. After decommissioning is finished, the GRAIL orbiters will be smashed into the Moon’s surface, in true NASA fashion. Here is one great graphic. 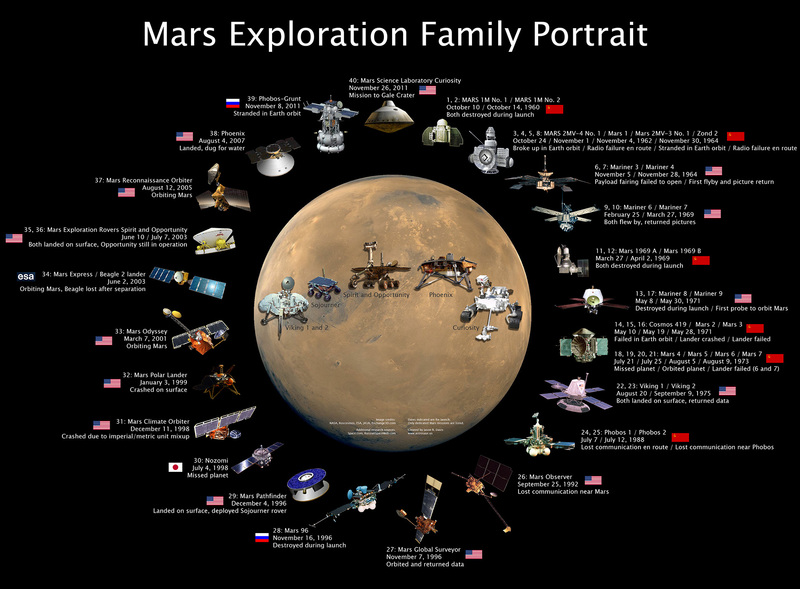 It depicts nearly every dedicated mission that humans have, or have attempted to, send to Mars. I only counted missions that had Mars as the end destination. Additionally, multi-craft missions only count once — unless two landers were sent on two different rockets. Represented in the center of the poster across the planet’s surface are all of the successful landers. 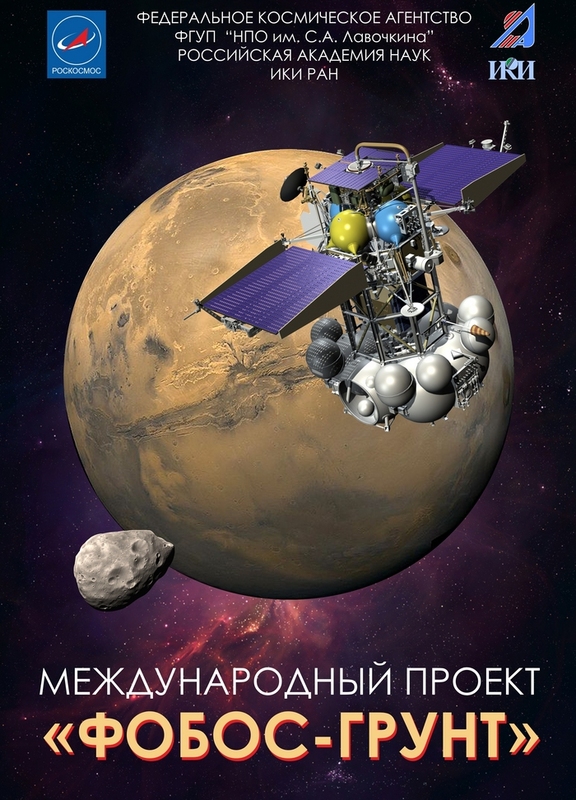 It’s being reported that the Russian Space Agency, Roscosmos, is publicly recognizing the dwindling possibility to regain contact and control of its latest Mars (Mars’ moon, Phobos, actually) mission, Phobos-Grunt. Phobos-Grunt launched on November 9 and made it into Earth orbit; however, it failed to fire its engines that would have sent it on its way to Mars’ moon Phobos. Engineers have tried in vain to contact the spacecraft, and Roscosmos deputy head Vitaliy Davydov said the situation now looked very grim. “One should be a realist,” he was quoted as saying by RIA Novosti. 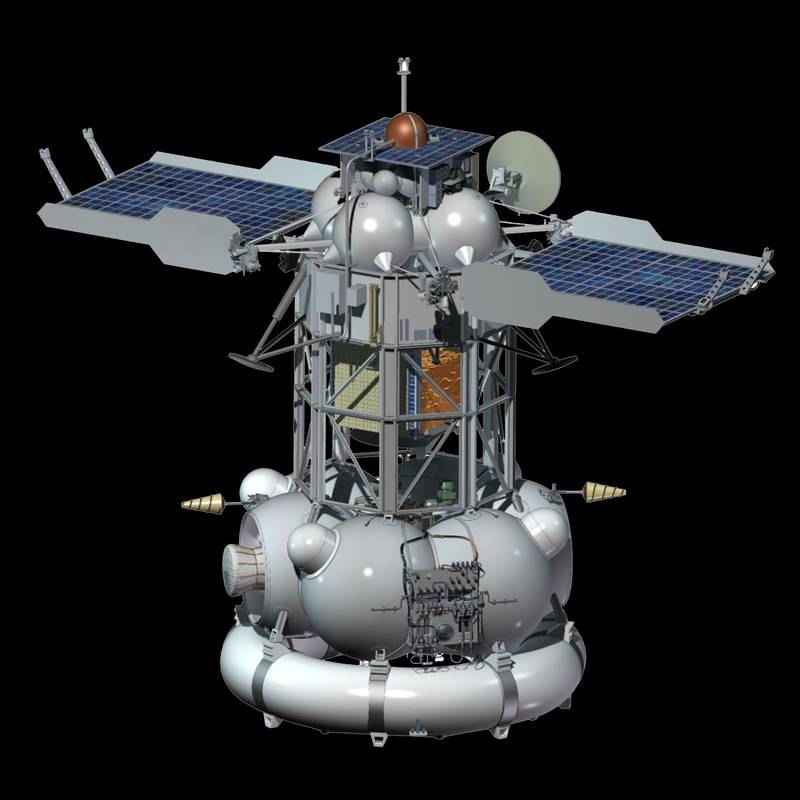 Later, another Russian news agency, Interfax, quoted Davydov as saying that Phobos-Grunt might fall from orbit anytime between late December 2011 and February 2012. This is unfortunate news on a couple of fronts. First, losing the mission to Phobos is tremendously disappointing. The research that would have been gained from that mission would have been remarkable. The second reason this situation is particularly unfortunate is that it’s not quite known what kind of consequences Earth might face when Phobos-Grunt drops out of orbit and comes crashing back down to Earth. It is currently holding quite a bit of fuel — the fuel that would have taken it to Phobos — and the design of fuel tanks often allows them to survive re-entry into Earth’s atmosphere more successfully than other spacecraft components. To be certain, both professionals and amateurs alike will be keeping their eyes on Phobos-Grunt and crunching the numbers to try and ascertain what might happen within the next few months if — and it is seemingly highly likely at this point — it comes back down to Earth. Any developments will be reported here. At around 10am EST (7 PST) this morning, the Mars Science Laboratory carrying the Curiosity rover, lifted off from NASA’s Kennedy Space Center in Florida. 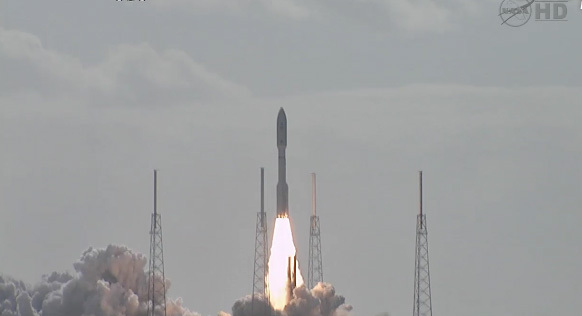 The powerful Atlas V rocket had no hesitation after it ignited and propelled the MSL off of the launchpad. Within a few minutes, the MSL was in orbit. 44 minutes after launch the spacecraft separated from the rocket putting it on a trajectory to reach Mars in August of 2012.